May Mercury, Gemini, and Apollo, guide you on this new endeavor! Dear Adventurers from NASA. I just have one thing to tell you about tomorrow’s launch… GOOD LUCK ! I will be watching on NASA TV so please lubricate well the internet. GOOD LUCK FOLKS ! I wish NASA good luck on the upcoming launch. We need our space program to thrive once again and we need a way to get to the ISS today….not tomorrow. As for the capturing of an asteroid and then going to Mars in the near future, do you think it could wait a little bit longer NASA? Good luck for the mission. When will the first crewed flight happen? I am so excited to watch this rocket lift of! I’m 11, and this is a big advancement in history for me to witness! All the best to NASA team! Hope to see NASA go beyond Mars and the Solar System! Good wishes to all at NASA and the entire humanity! Where in North America will people be able to see the rocket launch? Will its flight path be Northward up the Eastern seaboard? For how long after launch will the rocket be visible to the naked eye? -I KNOW THIS TEST FLIGHT TO REACH FARTS POINT FROM OUR PLANT (UNMANNED). – I KNOW YOU DO OPTIMUM CALCULATION IN THIS JOINERY. – I SPEAK FROM POINT OF SAFETY THERE PROB LIME WITH ME I DO NOT KNOW WHY YOU USE PARACHUTE IN RE ENTRY TO EARTH, THIS IS OLD AND LOW SAFE PROCEDURE TO LANDING. This is a great information source, however, why not include a small paragraph explaining what each “reference number” is in the graphic? For example, what is happening at “3” what about “4”, etc. I realize the numbers are for linking the two views, but a little explanation would also be extremely educational. Is Orion capable of landing a craft on Mars and then able to reach escape velocity for the return home? If not what is the major obstacle and what will it take to overcome it? Good Luck! I hope we will have a great launch and re-entry day!!! Perfect! Would love to be there in person. I am so excited that we are going back out into space and increasing our knowledge of the universe around us!! The technology that is going to be developed along the way is going to be amazing! Sounds exciting! Wait, are we in the 1960’s? Oh we’re not? Nevermind. The test flight tomorrow takes me back to the excitement of the 1960’s with all the flights that tested the required techniques of going to, orbiting, landing, and returning from the Moon! 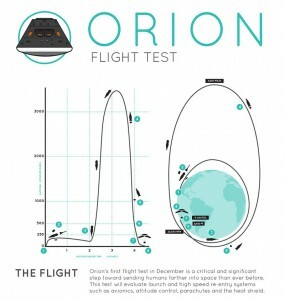 Can’t wait till the first manned Orion mission! God speed Orion! Where can i go to see the launch in person? Very excited to see NASA get back onboard with human space flight initiatives. Will there be any remote sensing / imagery gathering from the 3,000 + mile apogee? It would be nice to modern imagery / video of our blue marble from that high up. Wishing the whole team a successful mission tomorrow! This is a exciting new development for NASA. Are there any plans to take any modern imagery of our blue marble from the 3,000 mile plus apogee? Wishing the whole team a successful mission tomorrow! This is the third page I’ve visited looking for launch location and so far all I hand gotten is space complex 37. Please somebody… Is that at Canaveral? Wallops? Somewhere else? Thanks! Will ISS crew be able to see Orion launch or re entry? Never mind, Google and Wikipedia came through yet again! The Orion flight test chart that you have here shows the rocket taking off from somewhere near California. Can you please fix this mistake if possible and show it taking off from Cape Canaveral? Great to see us moving forward again in space! last time, one of your test was failed,so any precaution for further test…? Hoping for successful test flight. Good luck and Godspeed to the NASA team. Good luck this morning with the launch of the Orion spacecraft. Here’s to a glitch free performance!